Shinty legend Ronald Ross returned to the Kingussie side after responding to a player shortage, and scored two goals in a 3-2 win over Inveraray. The veteran, who has more than 1000 career goals, added to his tally in a dramatic return to the top team. Elsewhere, Newtonmore beat Lochaber 3-0 to go top of the Premiership, with Lovat's match against Kyles postponed. In the National Division, leaders Oban Camanachd moved two points clear after a 5-1 home win over Glenorchy. Third and fourth placed sides Beauly and Caberfeidh drew 1-1. At Spean Bridge, Fraser MacKintosh opened the scoring in the first half before Evan Menzies and Calum Stewart made it 3-0 to ensure Newtonmore went top of the table of goal difference. Third-placed Kingussie went 2-0 ahead after nine minutes thanks to Ross's double, but Lewis MacNicol and Peter MacIntyre drew Inveraray level before Bob MacGregor won it. 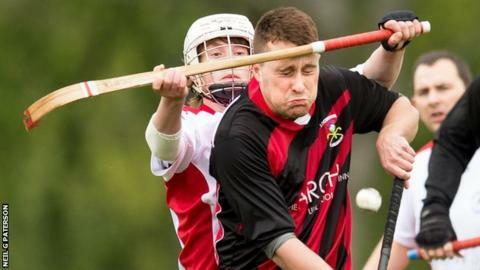 In the National Division derby match, Andrew McCuish and Lorn Dickie both struck twice for Oban Camanachd after Aidan MacIntyre's opener was cancelled out by Glenorchy's Kieran MacKay. Craig Morrison scored early for Caberfeidh in Beauly but Conor Cormac equalised in the dying seconds. Fort William made it two wins from two games with a 3-1 triumph over neighbours Kilmallie. Ryan Campbell scored a double, Michael Rodger replied and Arran MacPhee rounded it off. Two goals from Craig Anderson either side of Chris McGowan's strike made it 2-1 for Glasgow Mid Argyll over Bute at Yoker. In the second round of the Aberdein Considine Sutherland Cup, the game's junior championship, Matthew MacColl and Gordon Whyte both scored four as Kyles won 14-0 at Strathspey. Despite Kingussie's player shortage, their reserves disposed of Kilmallie's second team 8-0 at The Dell, with veteran Kevin Thain scoring four. Eleven man Lochbroom won 7-1 in Inverness while Lovat progressed 5-2 at home to Skye. Fort William had a 5-0 success over visitors Kinlochshiel.